Storytelling is our passion, and we have countless hours of experience to support us. Yes, you could just have Aunt Muriel record the ceremony on her iPad or home camera, and some people do! Everyone has different opinions on what's important for their wedding day (as we're sure you've already noticed from friends and family). But Aunt Muriel doesn't have years of practice and technical knowledge behind her, and she probably doesn't have high-quality equipment either. If you are looking for a video that not only captures the events of the day, but the emotion of it, nothing comes close to having a professional wedding film. In 50 years, this will still be the most complete memory of your wedding day, and we take that seriously. This will be the video your children watch, and the one their children watch. We customize your wedding day to make sure you're getting exactly the kind of video that you'll be happy with for a lifetime. We have a distinct style of work, curated and perfected over the course of dozens of weddings. Our style isn't for everyone, but if you're looking for a video that captures all the emotion of your wedding day in a documentary style, you need look no further. With over 80 weddings under our belt, we've seen everything. Broken DJ microphones, rainy days, off-schedule ceremonies, etc. We've been there, done that. That means we know how to problem solve when things go wrong to make sure you're still getting the most out of your wedding day. We make sure we have the best equipment to produce a film that's top quality. We always pride ourselves on professionalism, so we'll never show up to your wedding in jeans or a tennis shoes. You expect the best, and that's exactly what we intend to provide. 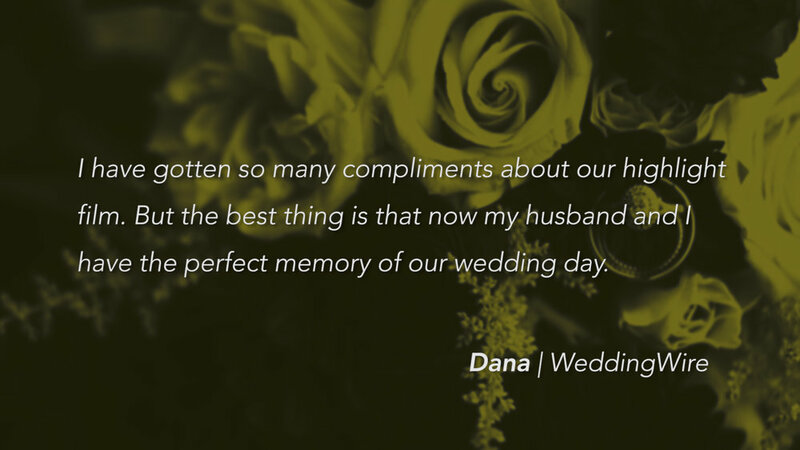 It is YOUR wedding after all; we customize it to fit YOUR needs. We don't shoot for a cookie-cutter edit like some other companies do, which means we often have a lot more footage of your day to choose from. More footage means more laughs. More kisses. More memories. For more info about what we do, or if you want to check availability for your wedding date, just fill out the form below, and we'll get in touch with you within a day or so!